Yes, I am a chocolate snob. You will only see me buy a chocolate bar out of desperation. If I need a quickie chocolate fix, I’ll reach for a bag of peanut M&Ms. But if I have the cash and a good quality chocolate is in the vicinity, I’ll pay for it. This isn’t to say I never buy American. I will buy/eat See’s or a chocolate shop’s chocolate. I should say that I’m talking milk chocolate, since I don’t care for dark chocolate. I just have a real preference for European chocolate. Why? It turns out that most American companies just don’t take the time and care to make quality chocolate. Milk chocolate is defined by government regulations stating contents of at least 10 percent chocolate liquor and 12 percent whole milk. It also contains more sugar than dark chocolate, at least 3.39 percent butterfat, and the addition of cocoa butter and flavoring (usually vanilla). The difference between American and European chocolates is in the amount of cocoa butter and sugar they contain. In Europe, butter and creams have a higher fat content, and alcohol is added in some fillings to bring out flavor – which is banned in 36 American states which restrict the use of alcohol in candy. Americans tend to use acidified milk, which produces a different taste. Taste can also be altered by whether a manufacturer is using real vanilla or just artificial vanillin. There is often also a time differential. During the chocolate making process there is a step called “conching”. During conching the chocolate liquid is stirred and mixed at a temperature of about 180F. During this process friction between the sugar and the cacao particles occurs. 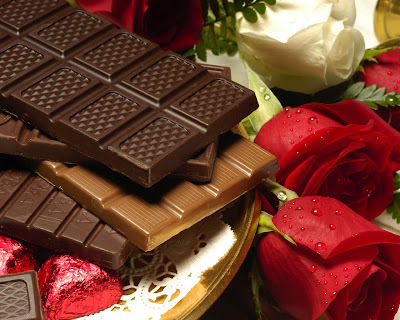 The friction causes "polishing" of the particles contributing to the smooth taste of the chocolate. Good chocolate should melt in your mouth without a "grainy" feeling being left on your tongue! Most chocolate producers use the process where the liquid mass is conched between a few hours and one day. Some chocolates are conched very little or not at all (most of the domestic supermarket chocolates) resulting in mediocre taste and consistency. Better quality chocolates are conched longer. Valhrona does their chocolate for five days! All of this contributes to a better tasting chocolate with a smoother, creamier melt than mediocre quality chocolate. Chocolate should melt at 96º, the perfect temperature to melt in your mouth without having to chew your chocolate. (Quality chocolate should be allowed to melt in your mouth unless it has a filling, then chew!) If the melting point is too high it will result in a waxy feel and not completely melt. You want to have a nice, smooth coating of chocolate throughout your mouth. So now I challenge you. Go pick up a Hershey bar for 60 cents and then a Lindt or Galler bar for $3-5. You can taste the difference!